Well that's an interesting theory. Hmmm... I know it's from Sorcha Faal... but it ties in. And then some will remember the colorful Squiddy from the Bezerk thread. She made two posts to the BZ thread on 3/11 regarding MH370. plane had a 'female' on board that was carrying one of the jigsaw pieces mentioned 3 years ago from the meeting in india. the pieces are all coming together. the documents in the briefcases were a timetable, but there are many ancient factions who are aware of the various artifacts hidden about the world. just to clarify.they were flying to China to take possession of one of the pieces. Now won't this be a colossal coincidence if my up dates on the coevolution thread and viruses ended up tying in with BEZERK and missing plane for reasons suggested above. Is it the wreckage? Michael Hoebel is pictured showing an image of what he believes is the wreckage of missing Malaysia Airlines flight MH370. 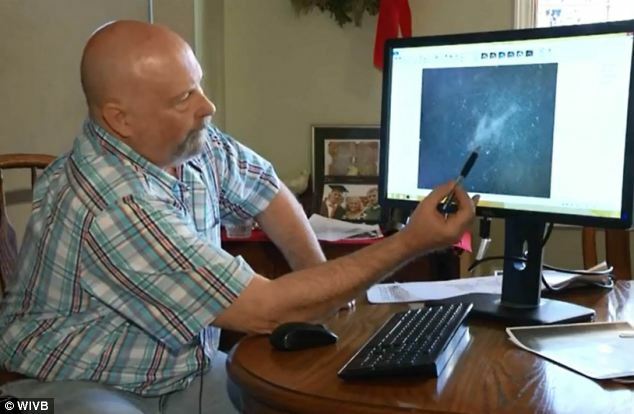 He found the image on a website that shares satellite images. It also allows other users to rate whether or not they agree with another user's theory - and so far, no one has disagreed with Hoebel's, he said. No one else has noted finding the wreckage at the same spot, he added. This weekend, Australian Prime Minister Tony Abbott said surface search efforts for the plane have been scaled back because it is 'highly unlikely' clues will be found on the surface." So now, it sure looks like this guy has something, but no one is interested? hmmm, wonder why that would be? and why, since these images were available to all, has no one seen them before now? Or do we have a second plane down, on the same day, in the same area nawww, I don't think that possible. "An Australian company says it has located the wreckage of a commercial airliner lying on the ocean floor in the Bay of Bengal - an area located in the northern tip of the original search area, but thousands of miles from where authorities are currently focused." Tech firm GeoResonance claims its sensor technology has found the wreckage of a plane in the Bay of Bengal, 118 miles south of Bangladesh. The company said images taken of the same spot five days earlier showed it had appeared between the 5th and 10th of March 2014. 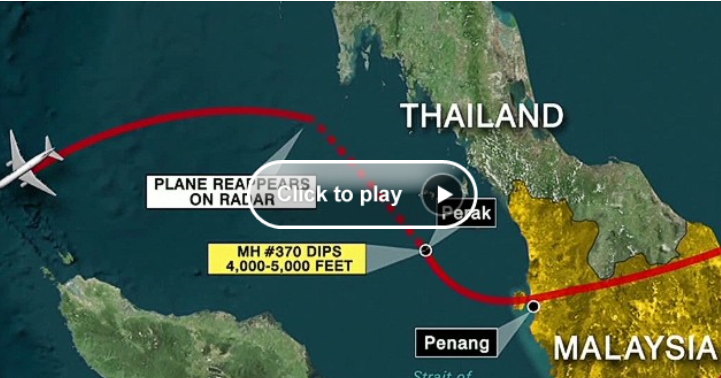 The plane disappeared on March 8. This would be the find that Acolyte referenced in his shout about the island in the Bay of Bengal. VYCI that Celtec mentioned in her original post. So now everyone is going to find planes on the ocean bottom? Just FYI, This is nowhere close to the US pilot's find. Here is Acolyte's link also. While this reports says that 11 suspects have been arrested, I would have to ask..."arrested for what?" You cant even find the plane. Good one Imelda makes me think about some things that have happened just recently. Timing IS everything. 11 terrorists ages 22 to 55. Who cares how old they are? Sounds like they are gearing up for the "We found the plane, this was a hijack attempt" routine. It will make it more plausible when they don't have anything to report for months and months, because, well there's nothing to report anyway! Silly civilian humans; tricks may be for kids, but hijinx are for those at the tippy-top.. huzzah! "The girlfriend of an American passenger aboard missing Flight MH370 told NBC News she has been the victim of two break-ins, a death threat and numerous unsettling phone calls since the jet vanished. Sarah Bajc received an instant message warning that "I'm going to come and kill you next" about two weeks after the Malaysia Airlines plane disappeared on March 8. Several pornographic images and creepy phone calls were also received from the same China-based number. Bajc was preparing to move from Beijing to live with passenger Philip Wood, a 50-year-old Texas native and IBM Malaysia employee, in Kuala Lumpur at the time of the tragedy. This is a curious bit of info -- who in china would want to kill this lovely mossad double agent, except the very people that hired her? sic.... Death threats, and phone calls and break-ins Oh! my! (Reuters) - A Laotian air force plane with at least 14 people on board crashed on Saturday, a defence ministry source said, and a witness at the site said the defence minister was among the dead. 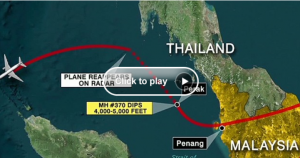 Malaysia Air Flight 370: Who Has Satellite Data That Shaped the Search? Andrew Bartzis sounds good but..
and have distanced themselves from his claims. He talks an interesting talk for many years now. However......... You will not find this opinion elsewhere.. YET. "One of the most influential figures in Malaysia’s ruling party claims information about flight MH370 is being hidden and the Australian-led search for the plane off Western Australia is a waste of time and money. Dr Mahathir, 88, who was prime minister for 22 years from 1981, wrote in his personal blog he could not imagine that “the pilots made a soft landing in rough seas and then quietly went down with the aircraft”. Dr Mahathir suggested the United States' Central Intelligence Agency had knowledge of the disappearance of the plane with 239 people on board but was not sharing it with Malaysia. He also claimed that Boeing, the plane’s maker, and “certain” government agencies, have the ability to remotely take over control of commercial airliners such as the missing Boeing 777. "KUALA LUMPUR, Malaysia (AP) — The Malaysian government on Tuesday released 45 pages of raw satellite data it used to determine the flight path of the missing jetliner, information long sought by relatives of some of the 239 people on board. But at least one independent expert said his initial impression was that the communication logs didn't include key assumptions, algorithms and metadata needed to validate the investigation team's conclusions that the plane flew south and crashed in a remote patch of the Indian Ocean. "It's a whole lot of stuff that is not very important to know," said Michael Exner, a satellite engineer who has been intensively researching the calculations. "There are probably two or three pages of important stuff, the rest is just noise. It doesn't add any value to our understanding." Almost three months since it went missing en route to Beijing from Kuala Lumpur, no trace of the jet has been found, an agonizing situation for family members stuck between grief and the faintest hope, no matter how unlikely, their loved ones might still be alive. The mystery disappearance also has nurtured speculation and wild conspiracy theories. Several family members have been highly critical of the Malaysian government's response, accusing them of failing to release timely information or even concealing it. The government, which in the early days did release contradictory information about the plane's movements, insists it is being transparent in what has been an unprecedented situation. An international investigation team led by Malaysia has concluded that the jet flew south after it was last spotted on Malaysian military radar about 90 minutes after takeoff and ended up in the southern Indian Ocean off western Australia. This conclusion is based on complex calculations derived in part from hourly transmissions between the plane and a communications satellite." Mystery: Could the pings have come from a "towed pinger locator"
The four acoustic 'pings' which led to the massive search of the southern Indian Ocean for the missing Malaysia Airlines plane - probably came from one of the search ships, it had been claimed. Authorities behind the search now think the noises, which were assumed to have come from the plane's black box flight or cockpit recorders, were produced by another man-made device unrelated to the vanished jet. A US Navy official has revealed that this could have come from one of the search ships - or even the pinger locater used to listen for underwater signals. The news comes as the first phase of the huge search of the ocean floor for the aircraft has been completed without any sign of the wreckage. Malaysia Airlines flight MH370 disappeared on 8 March 2014 carrying 227 passengers and 12 crew. The Boeing 777 had left Kuala Lumpur at 00.41 for Beijing Airport but lost contact which air traffic controllers at around 01.22am as it crossed the South China Sea.